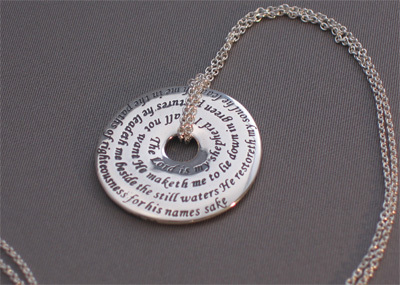 This necklace has been inscribed with the 23 Psalm. The Lord is my shepherd I shall not want. He maketh me to lie down in green pastures he leadeth me beside the still waters He restoreth my soul He leads me in paths of righteousness for his names sake. Each piece is accompanied by a storycard explaining the history or derivation of the inscription. 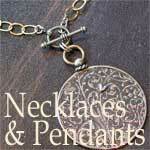 Chain: 18" [46mm] sterling cable chain.